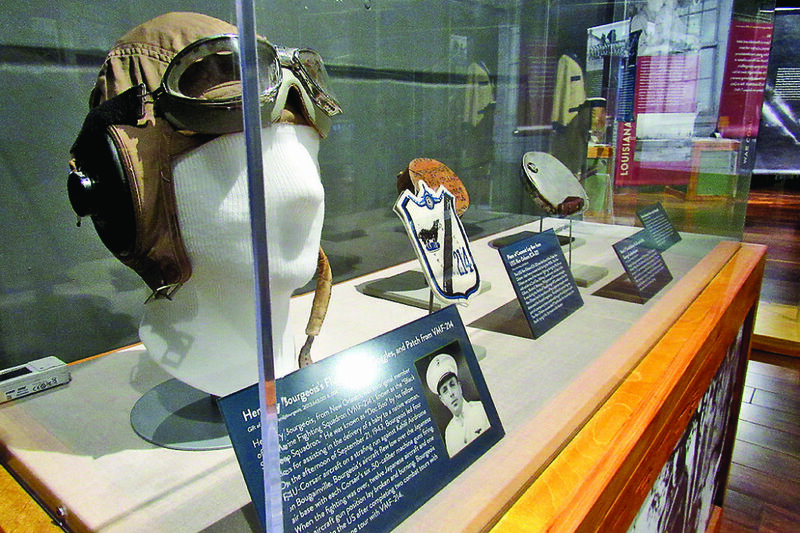 The exhibit displays artifacts such as the flight hat, goggles and patch from VMF-214 of Henry Bourgeois of New Orleans. Items from the Service of Lucien Laborde of Marksville. Several uniforms from various service men and women are featured in the exhibit. The Flying Tigers Patch and Distinguished Flying Cross of Thomas Sanders of Big Cane. This is the enameled headstone photograph of Benton J. Broussard of Crowley. In back is the WWII Honor List of Dead and Missing in Louisiana. See more of the exhibition at the reception Friday, Feb. 1. The exhibit will be in the Louisiana Sports Hall of Fame until March 15. Lieutenant Governor Billy Nungesser and the Louisiana State Museum will unveil a new special exhibition at the Louisiana Sports Hall of Fame and Northwest Louisiana History Museum Friday, Feb. 1 called “The Pelican State Goes to War: Louisiana in World War II.” Produced by The National WWII Museum, the exhibition will feature artifacts, photographs and oral histories that highlight Louisiana’s extraordinary contribution to America’s war efforts during World War II. The exhibition opens with a reception Friday, Feb. 1 from 5 – 8 p.m. and a special performance by the Victory Belles. The public is invited to this free opening event. On Dec. 8, 1941, just one day after the Pearl Harbor attacks, the United States officially entered World War II; Louisiana, however, was already front and center in the country’s defense preparations. From 1940 to 1945, the state hosted the largest maneuvers in U.S. military history, witnessed massive changes to its industrial base, and saw its citizens become enthusiastic contributors to what President Franklin Delano Roosevelt deemed “The Arsenal of Democracy. During World War II, many citizens of Louisiana contributed to victory on the battlefield with nearly 280,000 individuals from the state serving in the armed forces. The Pelican State Goes to War will share the courageous stories of Louisiana’s six Medal of Honor recipients, which represent sacrifice and devotion. The exhibition will also explore tales from Louisiana’s home front, ranging from the great mobilization efforts of Higgins Industries to first grader Billy Michal’s efforts to collect scrap metal for his school. The Pelican State Goes to War will be on display through March 15 in the Louisiana Sports Hall of Fame and Northwest Louisiana History Museum located at 800 Front St. For more information, visit www.louisianastatemuseum.org or call (318) 357-2493.